The world of social media is pretty messy when we consider identity. I have an ID on Twitter, Facebook, Google, Yahoo, LinkedIn, Plaxo, Xing, Ping, and many other social services. None of them talk to each other well and having to create my identity with yet another profile on each one of the services leads to severe limitations in my experience. While there have been attempts to establish a common ID (e.g. via the Open ID Foundation), those attempts are still in their infancy. In the end, all the social services fall back on my email address because that is a unique and consistent way of identifying me. With all the services that I subscribe to, I am expected to regularly check in several times a day to catch up on the news from my social network. I may actually do that several times a day on Twitter and Facebook but it is hardly realistic to keep track of multiple accounts. In the enterprise, the situation is similar with all the different social services such as Dropbox, Box, Yammer, SharePoint, Lync, Salesforce Chatter, SAP StreamWork or OpenText Pulse. That’s why all these vendors rely on email alerts to inform me that someone has posted a note for me on a social site. In fact, Twitter recently expanded the use of email alerts which indicates that social networks aren’t winning this particular battle. Email has managed to achieve what no other software managed to do yet – it trained me to come looking for new messages on a regular basis. Email is not a very good collaboration tool. Collaboration is about multiple persons jointly working on a task. When you receive those endless and frustrating email threats that keep CCing everyone, whether it’s relevant or not, you know that someone is using email for the wrong purpose. Social software can improve such collaboration significantly. However, email is a very effective way for any one-to-one and one-to-many communication. 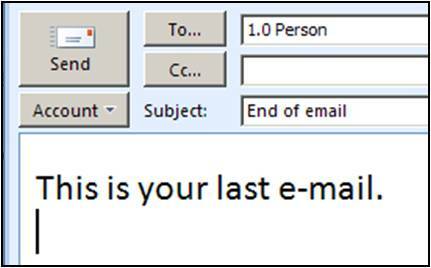 If I don’t expect a task to be worked on by a team, email is the right way to communicate to that team. Sure, I can send a “message” on Facebook but that’s really just email. Besides, Facebook sends me a real email to alert me about this message. Maybe, the new generation of millennials can do all their work on Facebook and not use email at all. But there is nothing wrong with using email – when used for the right type of communication. While I agree that email has many shortcomings, social media is not a panacea. I keep hearing complaints from people who get too many emails. Well folks, sorry to tell you, but you can just as well get too many messages in your social site. You can find a lot spam in your social networks and, if you are a poor communicator, social media isn’t going to save you. Social software has created tremendous opportunities for team collaboration but no, I don’t believe that it will make email obsolete anytime soon.